The Presiding Bishop of the Episcopal Church in the United States of America (ECUSA), the Most Rev Michael Curry, made a pilgrimage to the Holy Land during Holy Week this year. His focus was visiting some of the Holy Places for prayer and meditation and meeting with local Christian leaders and congregations. 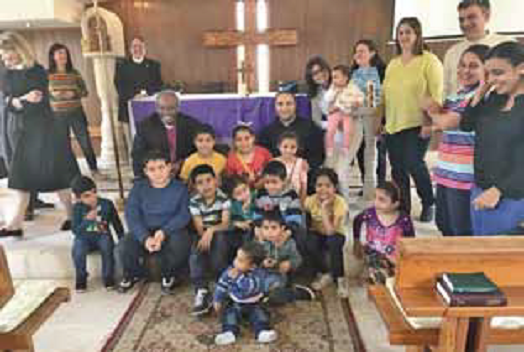 Like the Archbishop of Canterbury in May last year, Bishop Curry arrived in Amman, Jordan where he visited St. Paul’s Anglican Church and met local Christians including Iraqi refugees. Then, making his way across the Jordan River, he stopped to visit the baptismal site near Jericho before continuing up to Jerusalem. On Palm Sunday Bishop Curry preached a resounding sermon in St. George’s Cathedral in Jerusalem on the theme ‘There is another way’. Focusing on Jesus’ ride into Jerusalem on a donkey he contrasted Pilate riding in on a horse: humility as opposed to worldly power. And connecting this with the recent procession of young people into Washington DC demonstrating against guns, he made the powerful point that the world can be a different place if we follow Christ’s example. On Palm Sunday evening the bishop was installed as a Canon at St. George’s Cathedral. 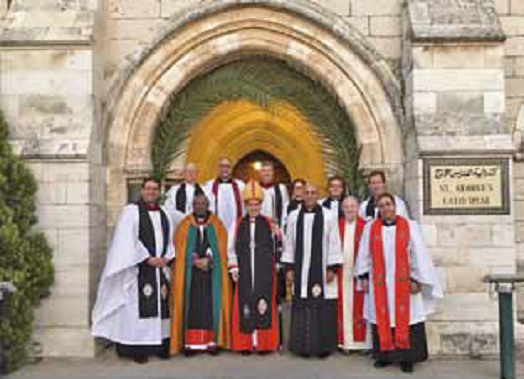 Accompanied by a number of assistants from ECUSA and travelling with the Anglican Archbishop in Jerusalem, the Most Reverend Suheil Dawani, Bishop Curry visited Bethlehem where he prayed in the cave of Jesus’ birth in the Church of the Nativity and met with the Greek Orthodox Archbishop. In Nazareth he met with local leaders and with young people at Christ Church School. In the West Bank he visited the church and clinic at Zebabdeh. He attended Holy Week Orthodox liturgies in Jerusalem including the Greek Foot Washing on Maundy Thursday. And in the early morning of Good Friday he walked the Via Dolorosa with local and international Christians. One of Presiding Bishop’s appointments was with His Beatitude Theophilus 111, the Greek Patriarch of Je rusal em, from whom he received the gift of a pectoral icon. Another visit was to the Anglican Ahli Arab hospital in Gaza. Throughout the pilgrimage Bishop Curry’s focus was on peace, reconciliation and education. The visit has refreshed the longstanding good relations between the Diocese of Jerusalem and the American Episcopal Church. The Holy Week pilgrimage was the Presiding Bishop’s first official visit to the Holy Land since being elected in 2015.